Chances are, couch co-op games were a big part of the reason why you chose to buy a Nintendo Switch. After all, Nintendo is the bonafide master of local co-op games, and the Switch is tailor-made for those experiences thanks to its Joy-Con controllers, which double up as two separate pads when you've got a friend nearby. But what are the best couch co-op games on Nintendo Switch, we hear you cry into the cold, unanswering void? Well, that's a question we aim to answer in this list. We've painstakingly searched reviews, your user scores, and various different websites to come up with this definitive list. And that means you can't argue with it, so there. Also, we're going with the definition that co-op games allow players to work together as teammates, as opposed to competing with each other. We're also only including games with local multiplayer on a single device, which rules out games like Splatoon 2. Right, with those ground rules out of the way, shall we begin? Note: This this has been updated for January 2019 with new titles, and we've re-ordered some of the existing games. Kirby Star Allies really should be higher on this list, considering that HAL developed it with four player local co-op firmly in mind. One of you plays as Kirby and recruits enemies to serve as allies, which any Joy-Con wielding friend nearby can take control of. You can even combine the abilities of your allies to various effect, like adding lightning or flames to your swords, but it never really comes together. That's largely down to the fact that the game is just far too easy, with simply no challenge in sight. It's definitely fun, but even young children will probably find the lack of challenging unsatisfying. Death Road To Canada allows fans of the zombie genre to live out their ultimate survival fantasies again and again. In the game, you can bring one other friend along with you on the wild and deadly road trip. As the game is quite a challenging roguelite, you will need all the help you can get. Mario + Rabbids Kingdom Battle does have an excellent co-op mode, with you and a friend tackling a variety of mission maps as your favourite characters. If this was the entire single player campaign, you can bet your bottom dollar that this would be much higher on the list. 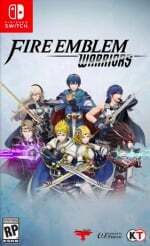 Fire Emblem Warriors combines the insanely addictive Dynasty Warriors combat with the strategy and dramatic plot of a Fire Emblem. The result is a unique game of taking strategic locations with force, directing troops, and battling bosses. You can play pretty much the entire experience in co-op as well. After a few short missions, a friend can pop in and join you as you work together to capture all of the strategic locations, defeat bosses, and find the secrets in each level. 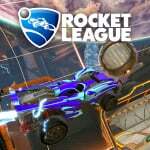 Rocket League is a fine online multiplayer game of driving really fast, pulling off insane tricks, and scoring ridiculous goals with an oversized ball in a car. Make no mistake, despite the odd concept, this is arguably the finest football game available right now. Local co-op is supported for up to four players, and you can battle against the AI in 2v2, 3v3, or 4v4 matches. That's plenty to dig your teeth into. The Binding of Isaac: Afterbirth+ offers four player local co-op in this Zelda-like endless dungeon crawler roguelike. Bit of a mouthful, eh? Sadly, you won't play as four Isaacs. Only player one is Isaac, with the other players playing as babies instead. 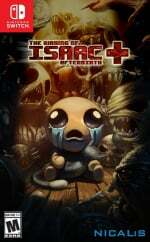 These deal half of the damage of Isaac, can fly, and only have a single heart container – which they take off Isaac when they join. 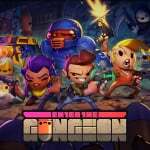 Enter the Gungeon is as mad as its name suggests. This is an absolutely bonkers bullet-infested roguelike in which you shoot, loot, roll, and flip a bunch of tables on your journey through hordes of enemies to earn the legendary gun that can... er, kill the past. Whatever that means. Who really cares about story – this is an action-packed shooter that makes the action of The Matrix look like a Yoga session for the elderly. 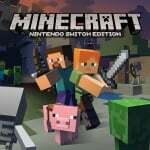 Minecraft was at one point the biggest game on the planet before Fortnite arrived to steal all of the limelight. Even so, its influence is far-reaching and explains the sheer number of copycat survival games and blocky builders. The original and best is available on Switch though, of course, and provides you with countless hours of co-op fun as you pretty much do anything you want from building stuff to crafting weapons and beating up enemies. Death Squared was built with co-op in mind, and boy does it do a good job of it. You have to work your way through a bunch of increasingly-challenging puzzling levels, helping two cuboid robots to stand on their same-coloured circle without destroying each other. It sounds easy, but navigating the various pitfalls and challenging sequences can be very challenging. 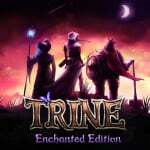 Trine Enchanted Edition is the origin story for the three unlikely heroes of Trine - Amadeus the Wizard, Pontius the Knight, and Zoya the Thief. Spellbound by the magical object Trine, the heroes must join forces to overcome obstacles and puzzles in a fully interactive physics-based world, battle the undead and their minions, and restore balance to the kingdom. This a great game for playing with one or two friends as you really need to work together to solve the puzzles and move to the next area. 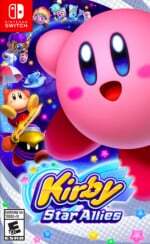 Snipperclips or Kirby Star Allies's Multiplayer... I can't decide! they both have great 4 player multiplayer! Hmmm Death Squared would've been my number one. Snipperclips would certainly be high up in my list as well, maybe even in the top three. But it is too limited and not that much fun with 4 players, so it gets a bit stale after a while. Great list! Glad local coop has made a resurgence last couple years. Snipperclips - game of the decade. also, i know its not co-op, but spiritsphere dx has been awesome for multi these days. Hhhhhmmm ... something seems fishy about the order of these. Did I miss Mario Odyssey on the list? My wife loved being the hat, we played through the entire game together. Edit...I see it on the list. @fluggy assuming you base this on the quality of the titles as a whole. The list is based on the quality of the co-op experience in the games and how much it offers. So in that case I’d say, this list is pretty accurate. Watching my son learn Enter the Gungeon now. Multiplayer here we come! But do any of these games compare to the king of Couch Co-Op, KNACK 2? Super Bomberman R has local 8-player with one console. It's notable for being the only switch game so far to do so. Also no Jackbox Party Pack? Didn't see ARMS, or some fighting games. I know Snipperclips is supposed to be co op, but whenever I played it there was always 1 or 2 people who decide not to cooperate and just run around cutting everyone. Eh, SnipperClips was only good at launch, even with the "Plus" content. Ever since more and more games came out, SnipperClips became a dust collector, up to the point that I deleted the game altogether. Now, I would honestly say that SnipperClips is fun on its own and great for the kiddies, but when it slips into a library that comprises of Super Bomberman R, Kirby Star Allies, Puyo Puyo Tetris, and the like, it honestly pales in comparison for me. Maybe Nine Parchments got extra points for being the newer game, but Lovers in a Dangerous Space Time is the much much better game and probably has more replay value too. My all time favorite is not on the list. Runbow deserves at least an honorable mention. What about Deathroad to Canada? Nice list. I hope there are more games with "helper" co-op like Mario Galaxy on the Wii. Those types would be good to play with my younger kids. Gotta point out a little mistake in the article here. Mario + Rabbids should get a higher rank and co-op isn't limited to merely a few challenges. Co-op mode contains five campaigns and some of the campaigns span 4-5 levels each. After purchasing the DLC, you get even more campaign/levels. Eventhough you have to playthrough the single player to unlock co-op campaigns, the co-op mode is quite substantial. Substantial enough to knock it into the top 10 imo. I'm guessing another 'unspoken' rule is that these have to be new games rather than 'virtual console' style games. Otherwise some of the shmups or something like Sengoku 3 would surely deserve to be top 30. Runbow - is missing, best 8 player co-op ever. Mario kart 8 - Renegade round up is soon much fun! 9 Parchments & Overcooked are my most played in coop. My girl and I enjoyed Donkey kong country tropical freeze co-op so much we finished it the weekend it came out. We also enjoy Resident evil revelations raid mode a lot, but the only way to play that together is with 2 switches and 2 copys of the game (wireless play). Hopefully we can have some more great co-op fun with Monster hunter generations ultimate next month, after Overcooked 2 of course 😁. Okay sure, but what about Soul Melter? Not the toughest thing out there, but my girlfriend and I definitely had to strategize and try quite a few times before we could crack it. Mighty good fun! ARMS isn’t on this list, making it obsolete, wrong, and bad. Okay, it’s not that bad of a list, but ARMS definitely deserves to be very high on it. I’m surprised not seeing wulverblade on this list. It’s been one of my favorite coop experiences so far and I’ve tried a few on the list in coop mode. @Captain_Gonru The entire Adventure Mode can be play cooperatively for up to 8 players. @ShadJV Agreed. I’m not sure why Captain Toad and Mario Odyssey are even on the list. That is not a good co-op experience. ARMS really impressed me with their co-op mode. Wizards of Legend? I can not believe it didn't make it on the list. @TuxDC I would like to see a resurgence of Mario Kart Double Dash on GameCube. I stuck my little brother on the back of the Kart throwing items while I could drive. I would love to play that with my young kids now. @sandman89 Absolutely! It's a great single player experience. I actually don't like the co-op that much as the second player is limited, (they have to be a specific character) and playing co-op introduced some odd game mechanics that I didn't take to. Thanks NF for putting together these lists. Number one and two are like a tie for me. Maybe Overcook can take the crown since is up to 4 players. I can’t see why Fifa and NBA and World Tennis are not in the list, if you are considering Mario Kart. Or these are the top 30 or so? @Mamabear definitely, because I didn’t even expect it yet ended up putting dozens of hours into co-op. My friend and I learned how to best work together, it was interactive. I had fun playing Odyssey with a friend but because it was a great game, that had nothing to do with the co-op which amounted to shouting to the second player, “Why are you over there? Come over here, I need the extra jump. NO DON’T MAKE ME JUMP THERE! I need to possess that thing.” And so on. Player two hardly did anything and mostly just had to be bossed around by player one... or tell player one what to do. It would be about as interactive if it literally just was single player with the second player just there for moral support. Would love to see this type of article for best games featuring local wireless play too. @DTfeartheBEARD You can play raid mode split-screen on one Switch. @ButterSpill Only Revelations 2 has split screen raid mode, I was referring to Revelations 1. Crawl, Lovers in a dangerous space time (prob my #1) and overcooked def top 5 but can't believe Wizard Legend didn't make this list. That game is quickly rising to be my one of my fave local couch co-op games. So damn good. Snipperclips is a good call. Beyond that, in terms of family play, Kirby, Minecraft, Mario Odyssey, Sonic Mania, Skylanders Imaginators, and the Lego games rank much higher in my personal co-op list. And we haven't tried Pode yet, but it seems promising. @TidusUK This list is focused on couch co-op, not PvP. Lots of other games would likely be included with PvP. And you misrepresented his point about M+R. "There is an option for two player local co-op, but it's sadly limited to a select few challenges in which each player controls two characters. This would definitely rank higher if the option was more involved." He didn't say it would rank higher if there were other modes. He said it would rank higher in terms of couch co-op if there was more content available in that mode. Bud Spencer & Terrence Hill - Slaps and Beans has to be on #1 now. Come on, Captain Toad and Mario Odyssey, where co-op is a janky afterthought, but no Steredenn or Pode, the latter of which was specifically designed for co-op? 20XX - Actually pretty great as you're using different combat styles, so you compliment one another. Aces of the Luftwaffe Squadron - Great 4 player shooter and each player has unique flaws. Death Right Road to Canada - Brilliant for 2 people. Mercenary Kings: Reloaded Edition - Superb. Like Contra but you can explore the huge levels independently. N++: Ultimate Edition - The very definition of taking one for the team. Neurovoider - 4 player RNG twin stick shooter. If you're really into co-op this ranks higher than Gungeon IMHO. Ninja Shodown - Basically 4 player Super Crate Box with added wall climbing. Portal Knights - Great co-op Minecraft-style experience. Steredenn: Binary Stars - Crazy shootemup action but maybe a shame you share the same pool of lives. Streets of Red: Devil’s Dare Deluxe - 4 player scrolling beat em up?? Yes please! Tallowmere - Platforming hack n' slash with random levels. Ugly but super fun. @Mamabear I had forgotten about the player 2 riders throwing items in DoubleDash. That would be great. That "unbalanced" co-op mechanic you don't see much but makes playing with different skill level or age still a lot of fun. Fingers crossed for DoubleDash GameCube game eventually releasing on Switch. I am hoping all their old systems are somehow coming to Switch Online service eventually. No Adventure Pals??? Come on! True, but doesn't pvp refer only to the versus mode. It's an awesome addition but the article seems to focus more on the couch co-op aspect of the ranked games. Hmm none of these games really interest me, how about Zelda Four Swords, or a bit of Double Dragon... Bubble Bobble... Pang... Gauntlet (actually Hammerwatch looks good)... SmashTV. Where are the co-op coin-ops. Oops showing my age! @Turbo857 Yes, you're right. Mario+Rabbids co-op is fairly substantial and it's a lot of fun to strategize with a friend in that game. It should be much higher in the list. Vs. Mode is great too. A bunch of the ACA Neo Geo games! Metal Slug and Shock Troopers are a blast co-op. Ikaruga, Sky Force Reloaded, and other 2 player shooters have the co-op "coin-op" feel. Enter The Gungeon is a damn fine replacement for Smash TV. There's some indie beat-em'-ups too, but I haven't tried any yet. Not sure why MK8D is so low down. It's easy top 5, if not 1. What's with this "couch co-op" nonsense too? It's "co-op" - the original and best form of co-op. Other forms like "online co-op" deserve the ignominy of a prefix. What about Worms W.M.D? 👌 Easily one of my favorites. Great list but surely the co-op in donkey kong tropical freeze is better than that in captain toad or Mario odyssey? @Bunkerneath Because, as stated in the article, they changed the list to include Overcooked2. Also because they make some money by pushing their affiliate links. Mario odyssey, captain toad and rabbids are FANTASTIC games. Not great for multiplayer, unless player 2 likes doing really basic parts of the game. I like how the bottom of the list, e.g. the first page you see, is just 5 of the Switch's biggest Mario titles. Kirby games don't play like Smash Brothers. Smash Brothers plays like Kirby games LOL. KSS existed before the smash series and is a big influence on the smash series. Also considering it was Sakurai and Hal Labs that were tasked to work on it. Of course they worked off the foundation of their existing project/Kirby. No Arms on the list? Does that mean it is now an RPG game, without multiplayer? Did ARMS just touch you guys in a bad place or something? Goofy to have some of those games with limited co-op aspects, and not put it in either of your best mp/couch co-op lists. I really wish splatoon 2 had 1 on 1 turf war local. Sorry but not agreeing to your list at all. This list is too long and needs to be thinned out. No Tetris Puyo Puyo!? Remove Minecraft and replace with TPP. After the latest update, Minecraft in 2 player splitcreen runs the way 4 player splitcreen ran on the Switch which is not very good. Actually it's a hot mess. Very low framerate. As if they are skipping multiple frames a second just to get it to work in splitscreen. Also Mario Odyssey is not a co-op game. Period! Anyone who is interested in an amazing 4 player co-op game, check out that Lovers in Space game (can't remember the name but it's on the list). So much fun. @judicious_echoes I agree. Odyssey is NOT a co-op game. Put Luigi in Nintendo and then it's a co-op game. This second person pointing at the screen nonsense is NOT fun. At all. I'm hoping I'll find someone to play Lovers in a Dangerous Space Time with me at some point because I bought it, played it in single player and thought it was absolutely awful, but maybe it's more tolerable/less painstaking with another person. I kind of wish there was a way to sort the list to show games that support single Joy Con multiplayer (eg: I know Minecraft has couch multiplayer, but everyone needs either another set of Joy Cons or a Pro Controller). I want to see the multiplayer games I could play without having to buy extra equipment. Human Fall Flat & Adventure Pals are both really good fun couch Co-Op games too! Some people clearly don't understand the difference between Co-Op and PvP. I know 1 2 Switch gets a bad rap, but I'm surprised it's not in the top 20 above some these games that are mainly single player with tacked on 2 player modes. I mean it's not an amazing game, but I've had some fun times with it, especially with my kids. Nothing beats Mario Kart when it comes to a coop experience. it has tons more content and replayability than the likes of Mario Party and the other random indies on this list. TowerFall is in the top 3, right where it belongs. Capcom Beat 'Em Up Bundle! All seven games are 2-4 player co-op (player count depends on the game). I have most of these. 9 Parchments has gotten more playing time than them all! Every single week we play another Coop Game here or we play the one from last week till its finished, but we played not a single one of this list (intended) , cause after some minutes they were boring. Our favs are all NeoGeo Games, Ikaruga, Capcom BeatemUp Bundle, Sky Force Reloaded, Kitten Squad, Astro Bears and Wild Guns Reloaded. No NBA 2K Playgrounds 2 love? Playing the Season mode with Local Coop is marvellous. @invictus4000 aren’t all those minigames versus though? This is a co-op list. @Jtoomer Party Golf has local 8 player and it's one of the best games ever. I wish it ran more smoothly, but it's so fun I play it in single player and multiplayer very often. @Haywired it is amazing with multiple pleayers. Such an awesome game! Towerfall and Ultimate Chicken Horse. Any reason UCH hasn’t gotten a review yet? The fact this list contains no LEGO games is 🤔 Feel like those are some of the most fun co-op games on Switch. I still don't get how anything beats Mario Kart...at least until Smash Bros. comes out. Inversus - an excellent game, has co-op, cheap and often on sale. Super Chariot, Death Road to Canada, and Human Fall Flat are amazing fun in co-op as well, if couch co-op is what you're looking for. @Trajan local turfwar, like splatoon 1 has? Yes if that is missing, that is a mistake. I wish I had two switches so I could have this problem too. Weird that nobody discusses Fire Emblem Warriors being on this list in stead of Hyrule Warriors. HW lets coop players switch between a pool of up to four characters, which is more interesting than what the clone-like FEW has. @okeribok No, split screen. 1 switch, 1 game, 2 players. @okeribok it would be like Goldeneye or any console shooter before 2002. Screen peaking wasnt much of an issue. Just made sure you weren't wondering around aimlessly. 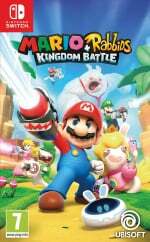 Mario + Rabbids massively underrated here from my point of view. I'd argue that "Pokemon Let's Go" is barely co-op, The second player can control attacks, and throw pokeballs, but that's it. They can't interact with anything, Nor can they even have their own items or pokemon, they just tag along and share your stuff. Sure, it's great for getting Younger gamers into pokemon, but it's FAR more limited in terms of co-op content than anything else on this list. Also, No Victor Vran, Mario Bros Deluxe, runbow, or smash? Well I still think smash would fit!